Have you always wanted to make great tasting BBQ? Now you can have the secrets of BBQ champions in a bottle! 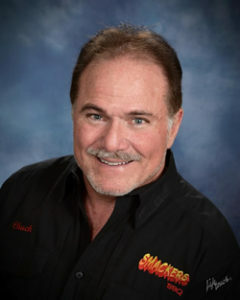 Smackers was developed by a veteran multi-certified BBQ judge and former restaurant owner, Chuck Averwater. Local to Memphis, Tennessee, which is arguably the BBQ capital of the world, Smackers contains ingredients Chuck discovered after decades of judging hundreds of the best BBQ teams from all over the world. One by one he selected the best ingredients which were then added to the Smackers formula to create a Sweet and Spicy BBQ seasoning with the perfect balance of flavors, the most difficult thing to master in making any food taste great. Watch your friends’ faces when you serve them delicious foods prepared with Smackers seasoning and sauces. They’ll want to know what it is and we certainly hope you can’t keep a secret! Smackers is so good, you’ll love passing it out as gifts for your family and friends. Try adding Smackers to gift baskets for out-of-town friends who love Memphis Products! You’ll want to buy a few extra bottles as gifts just to make sure your own bottles don’t disappear! Indulge your family and friends and try Smackers BBQ Seasoning and Sauces today! *Not affiliated with any other businesses using Smackers in their name.